It’s surströmming season and we did it!!! We ate surströmming!!! All four of us!!! So what is surströmming and what’s the big deal? It’s a northern Swedish dish of Baltic herring that has been fermented! They catch it in the spring and store it in a brine in barrels for a couple of months to start the fermenting process. Then, it is canned where it continues fermenting until it’s eaten. 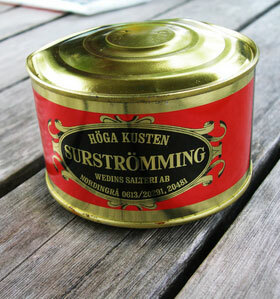 If you’re smart, you’ll open your can of surströmming outside! It does have an awful smell that permeates everything. We ate it in an open-faced sandwich with very thin crispy bread. Butter the bread, pile on the potatoes, cut the fish into tiny pieces and place it on the potatoes. We also added onion, tomatoes and sour cream. UMMMMM. It mostly tastes like salt, but there is a flavor that grows in your mouth and stomach that I can’t describe! Leftover food is thrown away because the smell and taste infuse it all. It was a very fun evening at our friends’ home, but our tummies were talking to us about it late into the night! So what else are we doing besides eating sour fish? Our boxes finally arrived last Wed, but badly damaged! We knew they were damaged in the States, but still were shocked at the sight of them. Some things were outside of the boxes, many had been opened, with lots of torn and crushed boxes. Thankfully, not much was damaged but things are missing. Unfortunately, we may not know all that was taken until we are back in the States and see what we left there. So we are now carefully going through everything and compiling a list of the damaged and the missing. We’re also putting together furniture from IKEA and more will arrive later this week to be built! And we have a couple of painting projects we’re working on together as a family. Pray we will also be faithful in our Swedish studies in the midst of everything else. We took the girls to Leo’s Lekland (Play land) to celebrate the end of summer. They started school yesterday in different classrooms. It just doesn’t yet seem right to be going to school in August. The weather has definitely become colder (highs in the 50’s) so that helps. They are in Välkomsten (the Welcome School) which is the school for kids who are immigrating to Sweden. Here they will learn Swedish, then when the teachers feel they are ready (probably between 3 months and a year) they will go to the regular public school. Everything is in Swedish so it is a challenge. Please pray they will catch on quickly. For Jensina, pray that she will stand strong in the Lord and have a Godly influence and leadership on her classmates rather than vice versa. She is the youngest in the class. Also pray that she does her homework and English and math that Gwen will be teaching in the afternoon with a good attitude – this is often a struggle for her. For Jiana, pray that as she stands strong in the Lord and makes the effort to become friends with the other children and thus be a Godly influence. So you made it! God is faithful! How is life in Sweden ? Is this first time for Tony and girls? I remember our (me and Gwen) times in Stocholm – we re quite young (!) then.